Great intentions.... that just didn't happen! 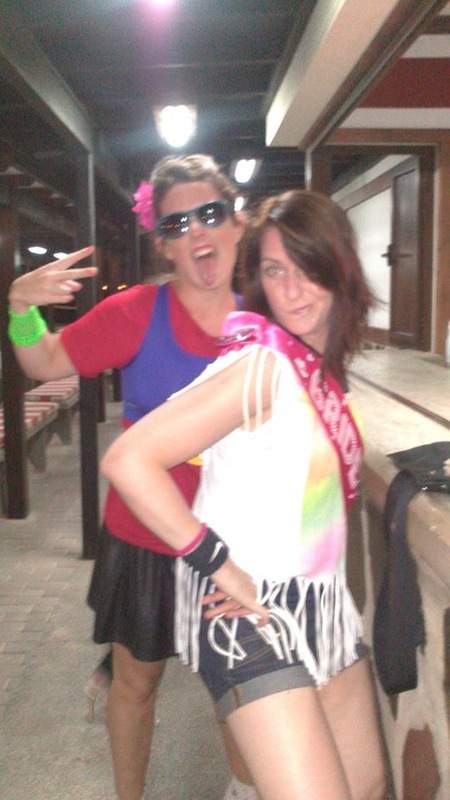 So I had Miss Parry's hen do for 5 day's and I think the best word to describe it is ‘carnage’! ‘Utter carnage’! So we made a pact before jumping on the plane that we would eat clean and enjoy our cheat being alcohol! So we travelled very early Friday morning, decided to have soup and water on the plane and landed around lunch time at Club La Sant, Lanzarotte! We ate clean for lunch which was perfect then danced in the afternoon, chilled out by the pool sunbathing and cracked open a bottle of fizz to toast to the next 5 days! That evening we visited a beautiful restaurant where we again ate clean with chicken and vegetables and a small portion of rice, but again many bottles of champagne was sipped! Next morning we had an early wake up call and headed off to Steve Watson’s RUSH training class. This really did clear our heads and push us to the max! It was about 29 degrees and the sweat was dripping out of us all! Following RUSH, Jo and I had a conversation regarding our fitness and since doing HIIT training on the detox we agreed our levels of fitness had increased massively! We didn't feel out of breath or lethargic throughout (only the following day) but it was great to see how well we could train to a high intensity in such heat for an hour! Fantastic! So Saturday night the first party night of the holiday. We headed to a tapas bar where we ate fresh meat, salad, fish , cous cous and plenty more healthy foods Oh and I hade a couple of homemade chips! Again we drank plenty of alcohol to wash down our dinner ;) and we all finished our meal off nicely with a ‘willy’ cupcake, which was handmade for Jo's party in a cupcake tower! So it was time to dance it all off in the disco and then walk back to our friends apartment for an hour as no taxis were running, so we burnt the alcohol right off! Not to mention our feet were killing! Day 3 in the hen party house! We had an extremely lazy morning by having a good long sleep in, which was preparation for the main party that night. We danced in a couple of the classes then hit the balcony for the rest of the afternoon to start having a few drinks in the sunshine and had a cheat meal of pizza, which we shared, our excuse being we had to line our stomachs for the mad party night ahead! So cracked open the Lanson Jo's ‘husband to be’ kindly bought us and got ready for the Rubicks cube night! It was just brilliant, everyone was drinking, laughing and we didn't stop dancing or running around swapping clothes to finally be dressed in one solid rubick cube colour! It was just fantastic and it was great to relax and enjoy the company with such amazing friends! Day 4 featured serious recovery and so we had a chilled one with a couple of glasses of fizz. Then we headed to the pool where I was taught to dive like a professional from Miss Parry unfortunately it ended up in a face flop and serious whiplash to the face, but all part of the fun hey! One of our amazingly thoughtful close friends called Sava did Jo a white class which she didn't know about and at the end she was placed on a chair in the middle with a vale on and the whole team danced the routine around her. A very emotional end to the week but just beautiful! So it was the last night :( I cant believe I am writing these words but it got to the point where I couldn't drink anymore (21 and saying that!)! My body isn't used to consuming so much alcohol after MCL. So I had a nice glass of wine at the meal and moved onto water! Unfortunately the last day had reached us, so we danced in the morning, chilled at the pool bar for a few hours then said goodbye to friends many of them we wouldn't be seeing for a while and it was back to Leeds! Such an amazing 5 days for Jo's party with such kind, considerate, thoughtful friends whom just made the Hen Do so spectacular! So now I am now officially BACK ON IT! Back into the gym, dancing and eating clean! No alcohol! If you are in need of some extra help and support the check out the girls website www.missioncleanlean.com for their new detox they have released for people living in Dubai plus their new Autumn Awakening 7 day plan. So everyone enjoy the rest of your week, it’s nearly the weekend! !